Beneath the root is a small bulb, which you can carefully remove. The bulb and root release a gas when cut. The gas irritates our sinuses and makes us tear up. We need to cut the root and bulb out as a whole. The best method is to take your paring knife and carefully cut downward into the onion, about and inch or two away from the root. Cut at an inward angle, about one third deep, and in a clockwise motion until the circle is complete. 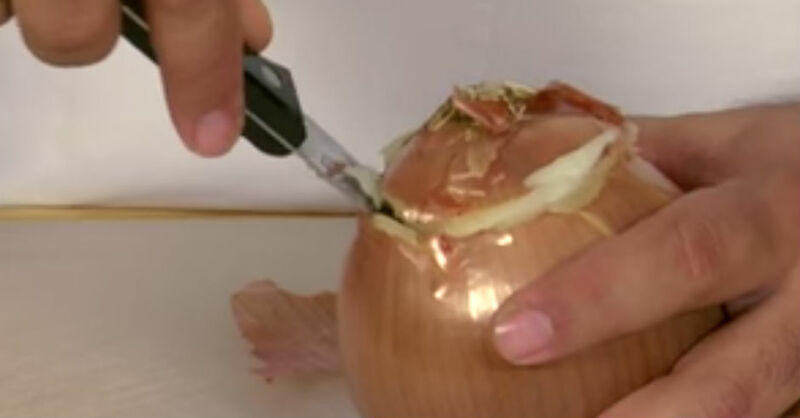 Once you have cut a complete circle, gently pull on the roots until the entire bulb is lifted free from the onion.